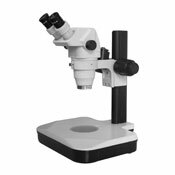 The GS Series stereo microscopes combine a compact design with super-sharp 3-D imaging and an extraordinarily wide field of view which makes this microscope an ideal choice for high-throughput inspection stations, Q.A. and engineering labs, higher education, hobby settings, conference rooms or any place you want to quickly and easily magnify a sample. The GS's cutting-edge precision optics produce excellent contrast and high-definition 3-D images all the way to the edge of the field of view. 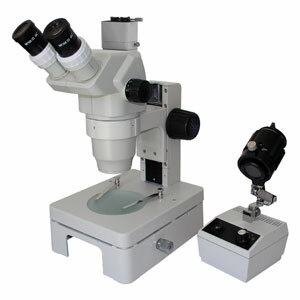 The 2X to 270X total magnification range and long working distance make the GS flexible enough to view a wide variety of objects. For users with space limitations, the Compact Track Stand w/Transmitted Halogen (70mm) Mirror Base is the perfect choice. Compact and highly portable, this stand allows users to position the GS head easily and accurately on a vertical track as well as manually adjust light control using the manual adjustable angle of the mirror base.This stand is ideal for inspection of small parts up to 10". With this trinocular/camera combo, the third (trinocular) port is used to mount a camera for processing micro-image acquisition and storage. The 3.0 megapixel CMOS camera provides high-resolution digital imaging without special voltage requirements, and there's no power cord needed, as power is supplied through computer. These new offerings produce stills of remarkable resolution, and high-quality moving images that may be projected in real time on computer screens, or saved to DVDs. With Dual Gooseneck lighting, the GS Digital provides users with cool, electronically isolated white lights that stay precisely where you place them. The GS Digital can also be used with no added light source. With the Quartz-Halogen Fiber Optic Ring Light, the GS Digital provides users with 360° of shadow free, on-axis, high intensity illumination. The ring distributes an intense light to the subject in a small mechanical package optimizing accessibility to the stage and specimen. The GS Digital can also be used with no added light source. With the Fluorescent Fiber Optic Ring Light, the GS Digital provides users with 360° of shadow free, on-axis, high intensity illumination. The ring distributes an intense light to the subject in a small mechanical package optimizing accessibility to the stage and specimen. The GS Digital can also be used with no added light source. With the LED Ring Light, the GS Digital provides users with 360° of adjustable, flicker-free illumination. This is especially useful for inspection and assembly environments, and is also well suited for video and machine vision applications. The GS Digital can also be used with no added light source. Features Snapshots, annotation, measurement, live image recording, and much more- Click Here to view additional software features. Operating Temp 0~70 deg. C.